...so this might not be a very long post. Yesterday was weirdly exhausting. We all ended up in a huge fight. It was dumb. Most of the arguments my family has are not over anything significant, but, in the way of fights, they will spiral into All The Things that are WRONG, Everywhere, ALWAYS. Last night it was over some timing around diner and a text that Mason failed to answer promptly. Simple stuff, really, easily straightened out--but thanks to being hangry and all of us in various states of hormones (Mason is in puberty, Shawn and I are menopausal), there was wailing and gnashing of teeth and much sobbing all around. We got through it, of course. But, then I had to bundle myself off to Wyrdsmiths, which often goes until 10:00 or 11:00 pm.... which is way, WAY past my bedtime. We had an excellent meeting, however. All of us came, for once, even the elusive Kelly. We reviewed two pieces, and spent a good deal of our time trying to convince Adam that while his memoir was fine and good, what it really needed was Elder Gods... or possibly dragons. Then, I went on an odd sort of rant about why not doing the dishes is NOT a crime against humanity based entirely, I think, on having too much time to think about one of the critique pieces while waiting on rugs to wash at the laundromat. But, between the argument and the late night, I have spent today in a kind of fog, even though today is the day that I usually meet up with Eleanor, pegkerr, and naomikritzer . We had a nice time at the coffee shop chatting about life, the universe and everything, actually, but, MAN, I would rather have been napping at home. I managed to NOT do my spell yesterday, but I did get it done today. Now my wife has talked me into re-watching "Highlander" (the TV series) because it appeared on Amazon Prime. It's objectively terrible... though I remember ADORING it in the 1990s. One thing we've been noticing as we've been going along is how few families seem to still do this whole road trip thing. We seem to be throwbacks, dragging our child across the country. Do people still do this? Today, however, was one of the few days I regretted this idea. We saw some pretty amazing things, which I'll get to in a moment, but we spent a lot of time on the road. Worse, we kept hitting road construction that was more than a slowdown through some orange cones. We'd come to a full stop and then have to wait for a "Follow Me: Pilot Vehicle." This was frustrating as heck, though occasionally it meant that I had time to frame a kind of lovely-in-its-starkness photo. I call this, "Lonely Fence Post." We also legitimately came across sections of road in Wyoming that had been sloppily paved over and a road sign that read, "Road Damage." My family and I spent some quality time trying to figure out if it was more expensive to print up the sign and mark the road or to actually fix it. Obviously, Wyoming Department of Transportation figured the signs were cheaper. We would pass signs that would tell us which era of rocks were exposed. There was a lot of "Pre-Cambrian" and "Lower Cretaceous." At one point, after a particularly long and arduous "Follow Me" truck construction zone, we decided to stop at a roadside diner called "The Meadowlark Resort," just outside of the town of Ten Sleep. The diner had a poster of Robert Taylor as Walt Longmire from the TV show Longmire/books by Craig Johnson. Apparently, the nearby town of Buffalo was an inspiration for the novelist. The only reason that was particularly striking to us is that Shawn and I, who loved the show, had started thinking about the fact that the landscape must be very similar to the faux Absaroka County that Longmire is the supposed sheriff of. It was good to sit and have a real meal, something we've been neglecting this whole trip. We've been subsisting on road food and things we've packed like trail mix, chips, beef jerky, and granola bars. A real omelet made by an actual short order cook was just the ticket. It probably added a half hour to our day, but I regret nothing. Except all that interstate driving. The interstate was hideously boring. I kind of wanted to claw my eyes out after driving for hours and hours along the interstate. The only good thing about the interstate was that the speed limit was 80. The gift store would sell you aliens. Also, because I could no longer take the Interstate, I insisted on a detour through "ANYTHING PRETTY." So we took off on 14-A towards the Black Hills National Forest. This also took us through Sundance, Sturgis, Leads, and Deadwood. The Black Hills National Forest was really amazing, but Mason was starting to lose it in the back and said, "OMG, it's just more rocks and trees. Shoot me now!" As you can see, he's not wrong. We were getting pretty punchy by this point, too, and Shawn was snapping photos by sticking the camera out of our sunroof. We got some surprisingly good shots that way. Then, finally, we made it to the hotel! I was super-ready to be here. Our only concern at this point is, do we really want to spend the next several days DRIVING AROUND???!! Ask me tonight and my answer would be: no $%! @ing way. I'm going to guess that tomorrow, I'll be all, "Pack up the car, we're on the road!" We have to AT LEAST see Mount Rushmore. Yesterday was a busy day for me. 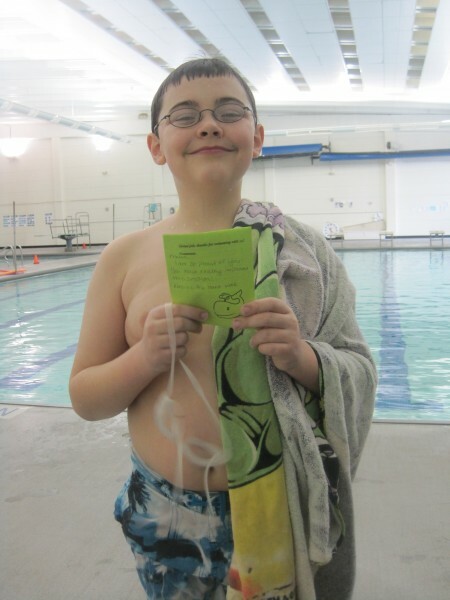 It started at 9 am, when we took Mason to his final Level 4 swim class of the season. Actually, his final Level 4 class EVER, because he passed the test! (Whoot!) I was glad that I stayed to see his beaming face when he showed us his certificate. I'd been considering bailing early, because I am Moon-Moon and accidentally scheduled a day of work at the library that was SUPPOSED to start AT 10 am, which was when Mason's class ended. But, when I realized my mistake, I was able to throw myself on the mercy of my scheduler at the library and she negotiated a 10:30 am start. Considering I had to work at White Bear Lake, I still didn't think that would be quite enough time. We had prepared Shawn with emergency taxi money JUST IN CASE. But, they actually let out class ten minutes early, so, believe it or not, I managed to zip everyone home (mostly, Shawn and Mason agreed to walk three blocks so I could make a quick turn around and get back on the highway,) and myself ALL THE WAY OUT to White Bear in 40 minutes. I might have considered the speed limit more of a guideline than a law, but... well, I got there with 5 minutes to spare. ...which means I came home with a bunch. GLADIATORS: History's Most Deadly Sport by Fik Meijer. THE COMFORT WOMEN: Japan's Brutal Regime of Enforced Prostitution in the Second World War by George Hicks. I.. yeah, I don't quite know what happens to me in the stacks, but SO MUCH looks interesting. I started GLADIATORS last night and I haven't learned much that I didn't already know yet, but what the hey? I may have accidentally picked up the second volume of the new Hawkeye title, but I thought I'd read it anyway. After racing home, I connected with our friend Andrew from New York who is in town for the weekend. He came over and regaled us with stories about taking the taxi to our house (which was apparently much harder than you'd expect) and his current life. I could have happily hung out with him for the rest of the night, but we had a long-standing St. Patrick's Day (observed) party at naomikritzer's we wanted to get to. So, I took him back to his hotel, and then we all went over. This is where Mason could have spent his night. He and Naomi's daughter Molly are huge pokemon fans, so they talked pokemon ALL NIGHT. Meanwhile, Shawn and I enjoyed the company and ate Naomi's husband's fantastic corned beef and veggies. I was actually an amazingly wonderful day, but, by the end of it, I felt like I'd driven all day long. I'm looking forward to today, because I THINK I successfully talked Shawn into a pajama day, and I'd really, really love to spend this Sunday lounging around the house. ....Oh, and in case anyone is on tenterhooks, Susan did not eat any of the minnow. She does seem to delight in terrorizing them by chasing them around, but we still have all seven after all.